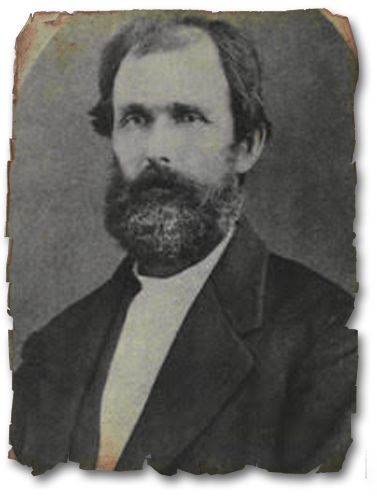 John Files Tom, legislator, son of Mary (Files) and William Tom, was born in Maury County, Tennessee, on April 22, 1818. He moved with his family to Texas in 1835 and settled at Washington-on-the-Brazos. At the age of seventeen he joined the volunteer army under command of Stephen F. Austin and participated in the battle of Concepción and the Grass Fight. He was gunner boy with Col. James C. Neill’s artillery in the siege of Bexar. He left San Antonio on February 11, 1836, and joined Sam Houston’s army in the retreat across Texas. In the battle of San Jacinto his knee was shattered by a musket ball; he was removed from the battlefield, taken to the home of Lorenzo de Zavala, and officially listed as killed in battle. Since Tom was a minor and was incapacitated by his wound, his headright and bounty certificates for his military service were redeemed by his father. On July 2, 1840, Tom married Mary Ann Moffitt; they had four daughters. The family moved to Seguin in 1846. Ten years later Tom was elected sheriff of Guadalupe County. He served for four years. In 1862 he moved to Atascosa County. During the Civil War he was commissioned to organize a ranger company for frontier protection. He was elected to the House of Representatives of the Fourteenth Texas Legislature and as a member of that body helped hold the upper floor of the Capitol for Governor Richard Coke in the Coke-Davis Controversy. In 1867 he became a Mason. Tom’s first wife died in 1873, and he married Nancy Henderson in 1875; they had seven children. Tom died in 1906 and was buried in the cemetery at Leakey. A. J. Sowell, Capt. John F. Tom (1906?). Texas Legislature, House Journal, 29th Leg., 2d called sess., 1906. Vertical Files, Dolph Briscoe Center for American History, University of Texas at Austin. Clarence R. Wharton, ed., Texas under Many Flags (5 vols., Chicago: American Historical Society, 1930). Handbook of Texas Online, Edith Harriette Long, “Tom, John Files,” accessed March 04, 2016,http://www.tshaonline.org/handbook/online/articles/fto13.